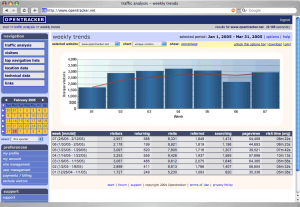 Traffic analysis >> daily trends. Trend analysis can be set to daily, weekly, and monthly intervals. Available website variables to chart include: unique, first time, and returning visitors, visits, referred and search engine visits, pageviews and avg visit time. For apps, chartable events include pinch, swipe, tap, forward, download, share and custom-definable events. This functionality is located in the Options bar (indicated with a wrench icon), along with the ability to make PDF, print or download .csv. Chart variables over time in both graph and table form. Daily trends graph Traffic through time with selected variable to chart. Variables available for charting: unique visitors, first time visitors, returning visitors, visits, referred visits, search engine visits, pageviews, visit time (avg). Red trend line The red line indicated trending averages through time selected. Column highlights The column selected in the Chart: drop-down is highlighted in white for easier reading.